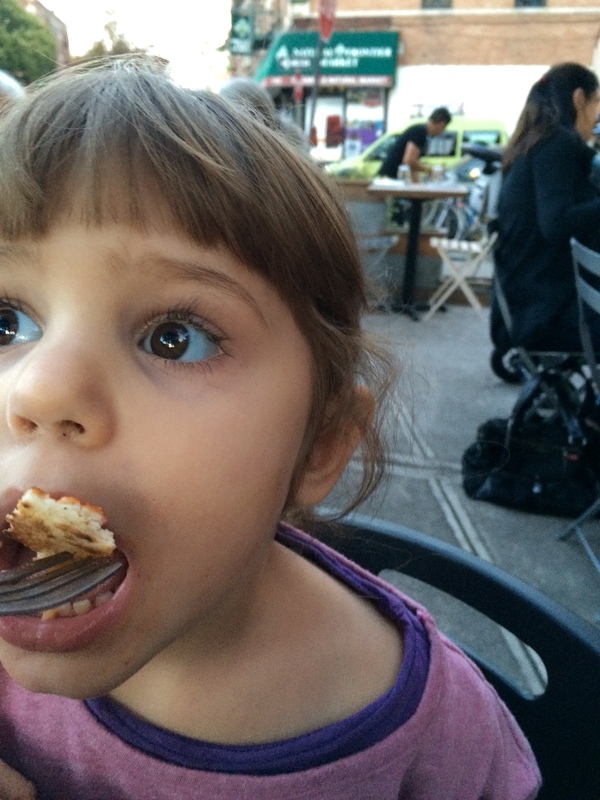 As many of you know, my child is highly motivated by food. Well, when she started preschool, I was faced with a dilemma. The school has pizza Fridays and Lily’s diet is so restrictive (she’s on the GAPS diet for those unaware), that pizza is a BIG no-no for her. Her dad and I both hemmed and hawed it for a while but agreed that it would be a great experience for her to fully participate in this sacred meal. She is VERY curious about what other people are eating (oftentimes, after she finishes her dinner, she starts to pick on mine) and she has so many restrictions in her day to day life that giving her this one – easy – thing would help her feel more of a part of something, rather than being on the sidelines – like she is with so much else. Lily LOVED pizza Friday. She ate consistently for a half hour. 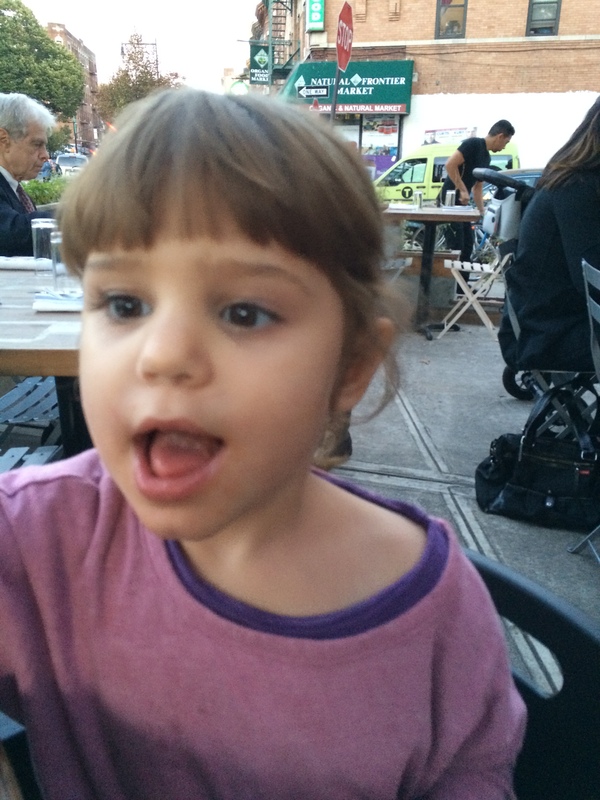 Lily loved it so much she was saying ‘give me’ and ‘more’… I was so proud of how much she was talking. Lily said more words in one day than she has in an entire month! So, yesterday was Friday and she didn’t have school so I decided to take her out for dinner and we had pizza! Again, she loved it. Again, she said more words at that meal than I had heard throughout the week. I wish every day were pizza Friday! Lily + preschool + germs = a very sick kid. Within the first month of school, she had to stay home three separate times because she was ill. Fevers and stomach bugs seem to be her thing. She most definitely is fresh meat, a phrase I am borrowing from my cousin Miriam. It perfectly describes my sweet Lily. For the first 3 1/2 years of her life she didn’t spend a lot of time with other children. She was so busy with one on one therapy (30 hours a week of it) that she was shielded from many of the germs that children pass on to each other. Not any longer. She is making up for lost time. The heartbreak I feel as a parent not knowing exactly how to console her, not knowing exactly what is wrong is indescribable. I know she wants to tell me that her head hurts her, that her tummy hurts, that can you rub my back mommy? But those words don’t come out. So I have to act as a mind reader. And I do the best that I can but I’m always second-guessing myself and I’m always feeling like I’m not doing enough for her. Today we both stayed home from school and work. Both of us are sick now. But I know we are on the mend and our immune systems will bounce back and be even stronger going forward. This past Sunday, friends and family from all over the country joined me and Lily – and countless other Rett families – to raise awareness, and funds for Rett Syndrome. I kept telling people this was like the wedding reception I never had. Except it wasn’t a wedding reception. And we came together for something I wish never existed. But wow was I glad we came together. There was so much love. So much laughter. So much acceptance. I was overwhelmed. Lily was overwhelmed. We both cried that day. For different reasons. Though L loves the outdoors (you should see how she stares up at the leaves on the trees during our evening walks), I think she didn’t love the crowds. And wow, our family is a crowd. 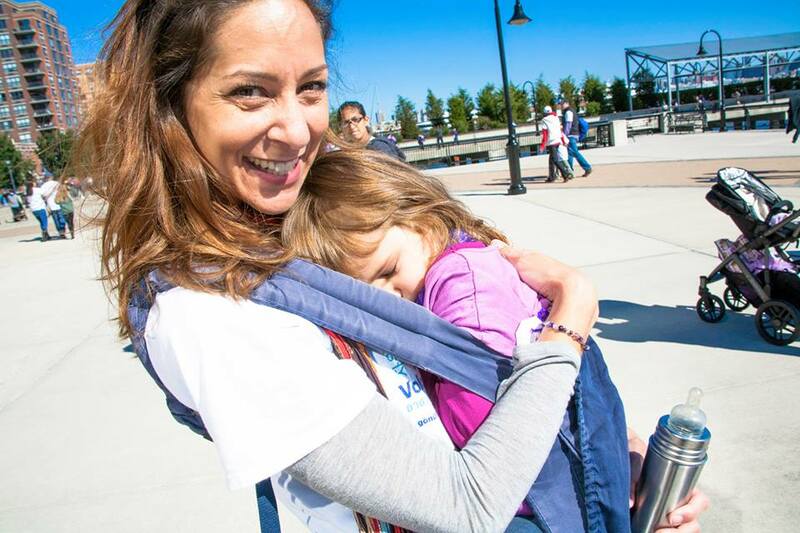 So she needed a lot of consoling throughout the walk. She cried a bit. 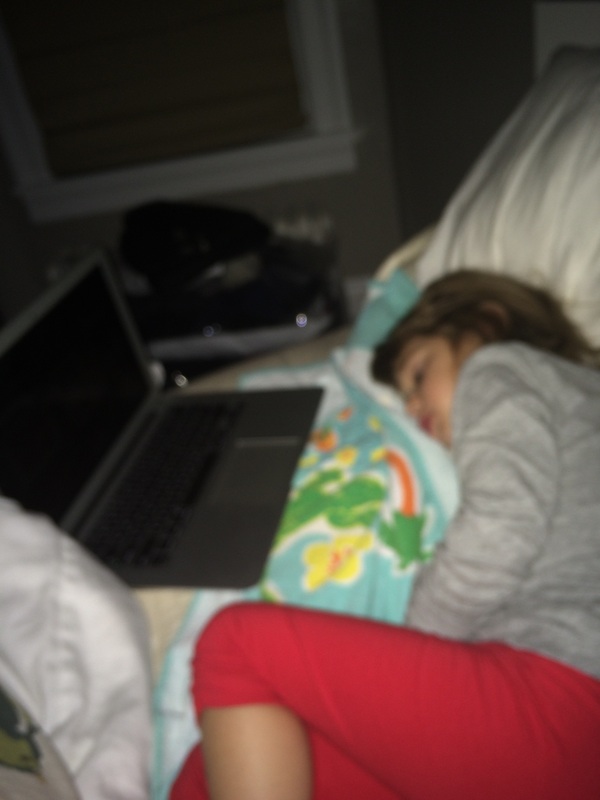 And sometimes, when she’s overwhelmed, she falls asleep. For me, the tears came from seeing all those Rett sweeties, knowing full well the struggles that these girls, and their families go through, the fears that I have for Lily’s future, the loss of what I thought Lily’s life would be like. But there were equal amounts happy tears – family reunion! There were people there that I hadn’t seen in YEARS. People who flew in from Florida, drove up to 6 hours to be there. For me. For Lily. For us. It’s my party and I’ll sleep if I want to. 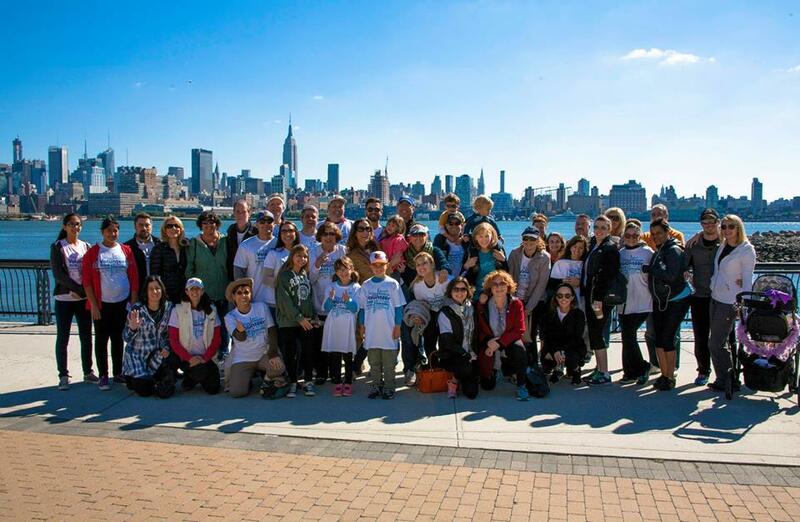 Team Lily NJ Strollathon 2014 – Top Fundraisers! !